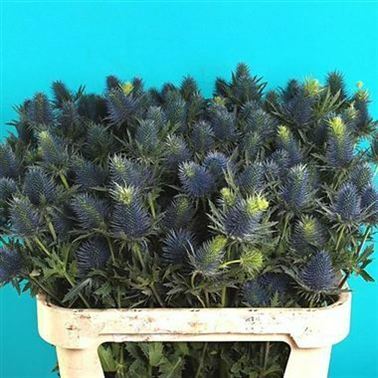 Eryngium Supernova (Sea Holly) is a large multi-headed purple/blue & green decorative thistle. 70cm tall & wholesaled in 20 stem wraps. Supernova is the largest headed eryngium variety. Eryngium, (otherwise commonly known as Sea Holly), is a genus of the Apiaceae family. Eryngium is famous for it's thistle shaped flower and is often used in Scottish wedding flowers. Eryngium flowers range from cobalt blue through to deep purple in colour with the exception of eryngium Alpinum White Star - the flowers on this variety are nearly white.